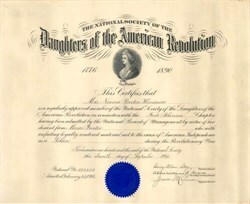 Beautifully engraved certificate from the National Society of the Daughters of the American Revolution issued in 1916. This historic document has an ornate border around it with a vignette of Mary Washington. This item is hand signed by the Society's president ( Daisy Allen Story ), recording secretary ( Abbie Williams R. Boyce ), and registar ( Grace M. Pierce ) and is over 86 years old. The certificatge was issued to Mrs. Norma Proctor Harrower who was a decendent of Moses Proctor who was a soldier during the Revolutionay War. 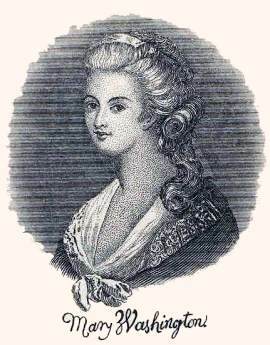 The National Society Daughters of the American Revolution was founded on October 11, 1890. Objectives: Historical - to perpetuate the memory and spirit of the men and women who achieved American Independence; Educational - to carry out the injunction of Washington in his farewell address to the American people, "to promote, as an object of primary importance, institutions for the general diffusion of knowledge, thus developing an enlightened public opinion� " and Patriotic - to cherish, maintain and extend the institutions of American freedom, to foster true patriotism and love of country, and to aid in securing for mankind all the blessings of liberty. The Society was incorporated under the laws of the District of Columbia June 4, 1891, and in 1896, incorporated by an Act of the United States Congress. President Grover Cleveland signed the charter. Under this Act of Incorporation, the Society reports annually to the United States Congress through the Smithsonian Institution.